Barring a military coup d’etat like they have in other countries, the U.S. will have selected a new president in November. Whoever that ends up being, this will be their ride. Meet the development mule for the next presidential limo. Since his inauguration, President Obama has used an armored, Cadillac-badged land barge nicknamed “Beast” thanks to its heavy truck platform underneath. It may look vaguely like a Cadillac sedan, but it’s as rugged as they come. 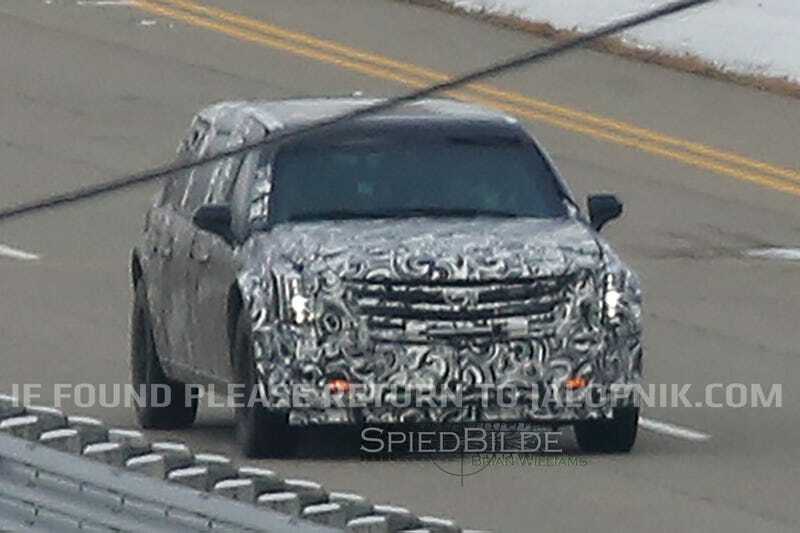 This new limousine clearly retains the new Cadillac grille we’re starting to see on cars like the XT5 crossover and CT6 sedan. And as our intrepid spy photographer notes, this mule does little to hide its heavy GM truck roots. Back in 2013, the U.S. Department of Homeland Security began soliciting bids to replace Obama’s aging limo. GM, which has built the car for the past 30 years, won the contract again, and it’s expected to go into service in 2017. An announcement on the car is expected sometime after the election, but like the current limo, expect many details about it to remain shrouded in secrecy for national security reasons.